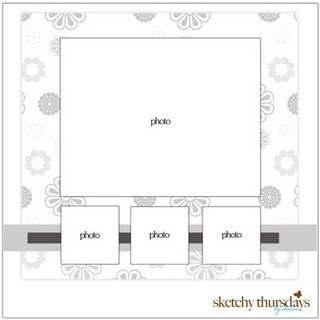 Sketchy Thursday is giving away lots of yummy goodies. If you want to have a chance to win, head on to their site and join in the fun. Cardstock ( paperbilities) * PP ( SEI , All about scrapbooking) * Sticker ( 7 Gypsies, SEI, EK Success) * Pen ( Sakura) * Chipboard Alpha ( Heidi Swapp). What an adorable, page, Vanessa! I am so glad you are playing along,I love to see your work every week! What a cutie LO - so is your photo! You make the best, happiest, feel-good pages!! Thanks for always playing with us. It's such a joy to look at your creations! your little one is sooooo cute! i love this page! this one jumps off the page...the background is soft and the photos perfect....and your interpretation of the sketch is great.